This schematic covers the complete Rainbow E-2 (e SERIES™) Ametek AME motor assembly that includes the bearings, gaskets, separator, field, and carbon brushes. Carbon brush holder kit for the E-2 (e SERIES™) AME design motor. If you need to replace this, then there is a very high chance that you have an armature issue. An easy way to tell the difference between the AME design and the GSE design is the carbon brush holders. The holders on the AME motor are brass and the GSE motor are plastic. Please call technical support with any questions you may have. Brass separator nut that fits the E-2 (e SERIES™) Rainbow system. Works with the R10827 separator. DOES NOT fit the E2 Type 12 Rainbow. Confirm that you have a brass nut and not white plastic. This part separates air from water and allows clean air to flow out through the exhaust and the water to be transferred back to the water pan. Separator for the single speed E-2 (e SERIES™) Rainbow. Does not fit the E2 Type 12 two speed system. Effective July 2000, Rexair has improved this separator to increase performance. Inexpensive upgrade to gain improved cleaning ability. View second image to compare original separator (R7805) with new design. If your nut that holds this item in place is brass, then this is the correct part. If you have a white plastic nut, then you need to order item number R12103. Spider nut for the E-2 (e SERIES™) AME design motor. The AME version motor is no longer available. The AME has brass carbon brush holders and the GSE has plastic. Spider for the E-2 (e SERIES™) version AME motor design. Please sure to download the schematics to confirm what version motor you have. Lower motor stage housing for the E-2 (e SERIES™) version AME motor design. An easy way to tell the difference between the AME design and the GSE design is the carbon brush holders. The holders on the AME motor are brass and the GSE motor are plastic. You may also call our technical support team to ask them any questions. Their number is 800-640-2033. Fan assembly for the E-2 (e SERIES™) AME design motor. A simple way to tell the difference between the AME design and the GSE design is the carbon brush holders. The holders on the AME motor are brass and the GSE motor are plastic. Be sure to check the center hole is not damaged from rust. Top hat spacer for the E-2 (e SERIES™) version AME motor design. Cooling fan shroud for the single speed E-2 (e SERIES™) AME version motor. Be sure to understand the difference between the AME and the GSE motor design. Download the schematics to confirm your application. This is the stage housing clip for the E-2 (e SERIES™) AME design motor. 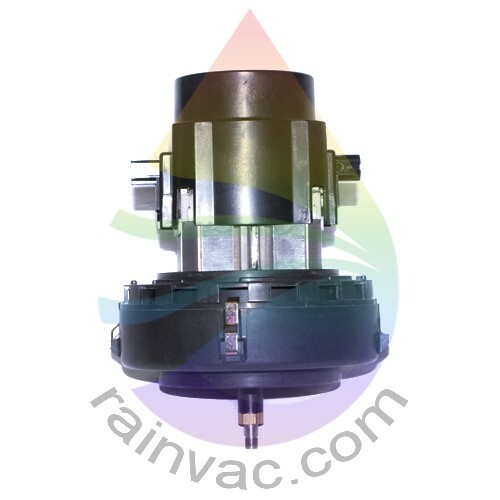 This part becomes rusted and corroded when excess moisture seeps into the motor. If you notice this, please call our technical support department to help determine where the problem lies. Motor gasket for the early version E-2 (e SERIES™) Rainbow system. Helps seal the motor to the water pan. Effective through serial number 9230145 with an end date of March 16th 2000. Works with the R7284 water pan gasket. UPDATE: This gasket is no longer available as an exact replacement. You have two options, order this item and get a universal factory OEM gasket that does not affect performance and is a direct install, or order an R11316 and R10534 while removing the R7284 original gasket. Fan washer for the E-2 (e SERIES™) AME design motor. If this part has rust on it, you need to look into why because you have a moisture issue. Motor cooling fan for the model E-2 (e SERIES™) version AME motor design. Unless you have the correct equipment to crimp this item into place, we suggest using JB Weld compound. If this part comes off, it will lead to motor failure. Be sure that you understand what version motor you have. The E-2 (e SERIES™) came with both a version GSE and AME. If you need help, call our technical support or view the schematics. Bearing bridge for the model E-2 (e SERIES™) Rainbow that fits the AME version motor. This bearing bridge works with the plastic brass brush holders. If you have plastic carbon brush holders, then you have a GSE version motor. Original OEM upper bearing for the E-2 (e SERIES™) Rainbow vacuum. This bearing will only fit the AME version motor. Location is above the carbon brushes seated inside the bearing bridge. Can sometimes be difficult to replace as the manufacture presses this bearing onto the armature shaft. Original OEM bearing for the E-2 (e SERIES™) Rainbow vacuum. This bearing fits both the AME version motor and also the GSE version. This bearing is located in the motor base on both motor designs. The motor base for the version AME motor design in the E-2 (e SERIES™) model Rainbow. This part is not available from the factory, so it will be from an existing motor and could show signs of cosmetic wear. We guarantee that is will be 100% perfect in construction and performance.